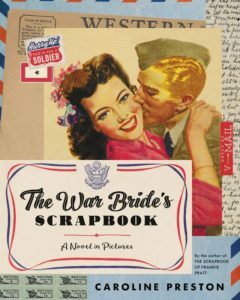 The War Bride’s Scrapbook by Caroline Preston is a novel about a couple – Lila and Perry – who meet in Charlottesville, VA in 1943 a few weeks before Perry is due to ship out for World War II. After a very fast courtship, Perry proposes, and they elope in a “furlough marriage” in which they spend exactly three days together as husband and wife before he leaves for the war. Lila decides to keep a scrapbook of their relationship, and The War Bride’s Scrapbook is exactly that – Lila and Perry’s relationship told through her diary entries, their letters back and forth, and a collection of real memorabilia (articles, postcards, photos, souvenirs, receipts, ads, trinkets, and much more) that help tell their story along with Lila. Lila moves to Cambridge to live with Perry’s family after he leaves, and the book is as much about her gaining her independence and pursuing a career as it is about their relationship and Perry’s time in Europe. There is suspense throughout the book too, as you worry along with Lila about Perry’s safety as an engineer on the front lines against the Germans. I loved The War Bride’s Scrapbook. I found myself reading it as slowly as possible just to draw out the experience. The scrapbook element is a lot of fun, as I spent as much time on each page studying the collage of artifacts as I did reading Lila’s story. Seeing all the minutiae really brought the story to life, much more so than just reading a diary. It’s also a pretty sad story, as Lila and Perry’s marriage doesn’t turn out to be the storybook romance she hoped for in the beginning. Don’t let the sunny photo on the cover fool you. I highly recommend The War Bride’s Scrapbook, especially for people who enjoy historical fiction. Preston clearly invested a lot of time and research into this book (her second scrapbook novel) and it shows. What a treasure.